Following on from my interview with a former rebel in the east Deraa countryside, I turn now to the west Deraa countryside, specifically the locality of Tasil in the Yarmouk Basin area, which is in close proximity to the Israeli-occupied Golan Heights. The Islamic State affiliate Jaysh Khalid bin al-Waleed took over Tasil as part of an offensive in February 2017. The rebels proved unable to reclaim Tasil from the group. Following the beginning of the Syrian government's campaign to reclaim the south, rebels in the Tasil military council reconciled with the government and participated in the final stage of the campaign to reclaim the Yarmouk Basin from Jaysh Khalid bin al-Waleed, which was eventually portrayed in Islamic State media as "Wilayat Hawran." The latest interviewee is Abu Mahmoud, who has served as a commander in the Tasil military council and is currently enlisted in the Russian-backed V Corps. Besides the discussion of the recapture of Tasil from the Islamic State, it is worth comparing what Abu Mahmoud says on the V Corps with the testimony of the former rebel in the east Deraa countryside, who is also enlisted in the V Corps. Note too the discussion here of recruitment efforts by the Syrian army's 4th Division, which is apparently offering similar promises to former rebels as the V Corps. Below is the interview. As usual, explanatory insertions are in square brackets. This interview was conducted over the course of 14-15 August 2018. Q: Firstly can you tell me a little about yourself? What were you doing for work before the events? A: [I am] a military commander within the military council for the locality of Tasil. I was studying at university and at the beginning of the events I abstained from graduating because of the crisis that occurred. Q: You were studying in Damascus University? Q: Right, but you did not graduate from university? A: Yes. I did not complete my studies because of the crisis. Q: So you returned to Tasil in 2011? Q: Were you with the idea of reconciliation before the military campaign? A: Before the campaign all rejected the idea of reconciliation but what happened, happened within joint international pressure. Q: Can you clarify when the military council for the locality of Tasil was formed? A: The end of 2016 in the 11th month. Q: And what was the aim of the formation of the council? A: Bringing together all the factions of the locality under one leadership to protect the locality. Q: So the aim was to unite ranks and resist the Da'esh [Islamic State] attacks? Q: Yes. But the question that suggests itself: how did Tasil and other localities quickly fall into the hands of Jaysh Khalid in February 2017? Jaysh Khalid launched a wide-scale attack and seized a number of localities in that month. A: Yes, a wide-scale and comprehensive attack was launched and Jaysh Khalid was aided by some of the leaders of the area in facilitating seizure of these localities. Q: You mean that some of the leaders were working for the interest of Jaysh Khalid? Even in the military council in Tasil? Q: It is also said that Jaysh Khalid broadcasted false announcements about a rapid advance for the organization through radio means in order to trick the factions and compel them to retreat. Is this true? A: Not true. What happened was an agreement between most of the leaders of the area to hand over to Jaysh Khalid. The MOC joint operations is well aware of this matter. Q: I see. After Jaysh Khalid seized Tasil, whither did the military council for the locality of Tasil go? To Nawa? A: Yes to Nawa and Jasim. Q: Why wasn't the Free Army able to advance against Jaysh Khalid before the military campaign against the south? A: Because the matter was not given the earnestness needed to fight Jaysh Khalid. All the battles were fake. Q: Meaning the Free Army did not think that Jaysh Khalid was a real problem? A: Yes they thought and realized this matter and its danger, but the weak-minded people- the leaders of the factions- are the ones who impeded advance in order to implement the agendas and plans of the neighbouring states. Q: Is it true that Israel gave support to some of the factions in order to fight Jaysh Khalid? Q: Is it possible for us to say also that corruption in the arms market was among the reasons for the lack of advance against Jaysh Khalid? I mean that arms given by the MOC to the factions were sold to Jaysh Khalid in the markets? A: Arms dealers sell arms to whoever. They care about gathering money. Thus the name is dealer. Q: Hahahaha. But I mean that some of the factions gave arms to the dealers as well? And from there they sold them to Jaysh Khalid? Q: Yes. Did many of the people in Tasil join Jaysh Khalid? A: No, small number only. Therefore the locality was dealt with by Jaysh Khalid in a way that was different from the rest of the areas subjected to their control. Q: How did the treatment differ? A: Marwan Zain al-Abidin received the position of the amir of the Hisba some time after they seized the areas, and when Marwan received it he began to degrade the old and youth by striking the soles of the feet, and from there a women's Hisba team particular to the locality of Tasil was formed, in order to degrade the women. Jaysh Khalid's treatment of the locality of Tasil was different from the rest of the localities and Jaysh Khalid feared the locality. Q: Marwan Zain al-Abidin was from Tasil, right? Q: Fine. With the beginning of the military campaign against the south, why did you choose reconciliation and to stay in the south? Some of the supporters of the opposition in the north say that you are frogs [regime agents] and traitors. What is your response? A: I chose to reconcile and remain in my country and land because most of the factions are run by the outside in order to implement specific agendas and the scenario of the south will be repeated in the north because the issue to end the war is an international issue by consensus and perhaps there will arise far fewer benefits in the north than in the south. Whoever calls us frogs, most of them are in the neighbouring states and are not in Syria. Among them are those still undertaking their work to gather the dollars so how can such a person characterize us in this way? We are not frogs. Q: Yes. And also it's better for you to remain in your land, because there is no dignity in a life of displacement and exile. Do you agree? Q: Fine. How was the locality of Tasil liberated? Who was the tip of the spear? The military council for the locality of Tasil? A: The locality of Tasil was entirely liberated through the military council for Tasil. 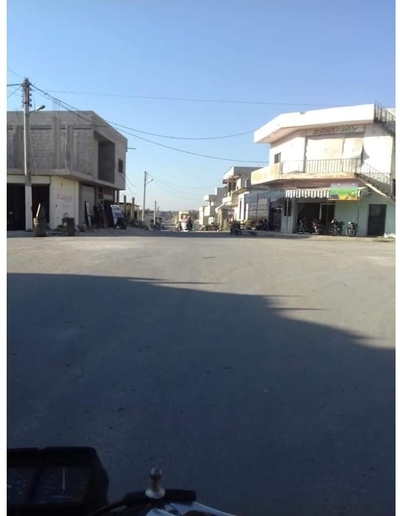 Jaysh Khalid withdrew from it and Tel al-Jumu' at noon on the day of the liberation. The military council entered Tel al-Jumu' at 3 p.m. and the locality [of Tasil] in the evening. Q: So there were no fierce battles inside the locality? A: No. Nothing fierce, nothing ordinary, not a shot. Q: Yes, but why this rapid collapse? Because of the intense airstrikes? A: Because all the amirs and commanders of Jaysh Khalid fled to the neighbouring states, abandoning ownership [of the matter]. So stumbling and lack of control arose among them. Q: But also the airstrikes had a big role, right? A: Yes. They caused convulsion in their ranks. Q: Yes. Did most of the families of Tasil return to their locality? A: Yes, immediately. All of them. Q: Did any people from Tasil go to the north? A: Yes, around 15 people went. Q: As for Marwan Zain al-Abidin is it true that the factions of Heet killed him? Q: Yes. You have now joined the V Corps right? Can you clarify what are the promises regarding service in the V Corps? There is talk for example that it is not necessary to serve outside Deraa and Quneitra. Also for the one who joins V Corps and is wanted for compulsory service, joining the V Corps is tantamount to compulsory service. A: V Corps service is compulsory service lasting one year and a half and is reckoned as part of compulsory service and is tantamount to compulsory service. But the advantages of this Corps is that the majority of it are people who were in Free Army and the service, according to the promises, is within Deraa province only. Q: Yes. So members of the military council for the locality of Tasil joined the V Corps before the liberation of Tasil? A: No, they joined after the liberation of Tasil. Not all members of the military council joined, for some of them decided to join the army directly. Q: I see. But you yourself joined the Corps, right? Why do you prefer the Corps to the regular army? A: Yes, I joined the Corps because its service is within my province only. Q: Who told you that service is within Deraa province only? Did you meet the Russians? A: Yes. Thus the Russians informed us. Q: Right but did you yourself meet with the Russians and they told you this directly? A: Leaders of the largest factions are the ones who continue to meet with the Russians and they are the ones who have informed us of that. Q: Yes. Do you know what the monthly salary is according to the promises? Also there is talk that the Russians said that the Corps' aim is to fight Da'esh in any place. A: The salary is $200. They have not told us about fighting Da'esh only. They have told us that service is within the province: checkpoints, borders, internal security. Q: Yes. In addition to V Corps, are there any other formations trying to recruit the youth of the region? Like the 4th Division? And Hezbollah and the IRGC? A: 4th Division only. And its benefits are the same benefits of the V Corps. Q: So there is no presence for Hezbollah and the IRGC in the Yarmouk Basin area? A: No. There is no presence. Q: Regarding the 4th Division, are they promising the same things? Service within the province only? Q: So most of the members of the military council for the locality of Tasil joined the V Corps and a small number joined 4th Division? Q: But if the 4th Division is promising the same things regarding military service within the province, why didn't you join the 4th Division? You don't have confidence in it? A: We registered in the Corps before the beginning of registration for the 4th Division. Q: I see. Where is the registration done? Inside the locality of Tasil? Q: So there is a centre for V Corps and another centre for the 4th Division? A: Yes. Registration in the Corps has ended. There has only remained registration for 4th. Q: I see. So they cannot accept more recruits. A: No, it's come to an end. Q: Yes. And there are no attempts by the air intelligence and military intelligence to recruit youth? Q: Yes. Lastly, did the idea of the revolution fail? And most of the people in Tasil got tired of the revolution? A: Yes, it failed because of weak-minded leaders and their attraction to their whims and interests and implementing the projects and plans of neighbouring states. The people got tired of the war, killing, destruction, displacement and lack of work. Q: So in the end the leaders of the factions were concerned with money and dealing in blood alone?